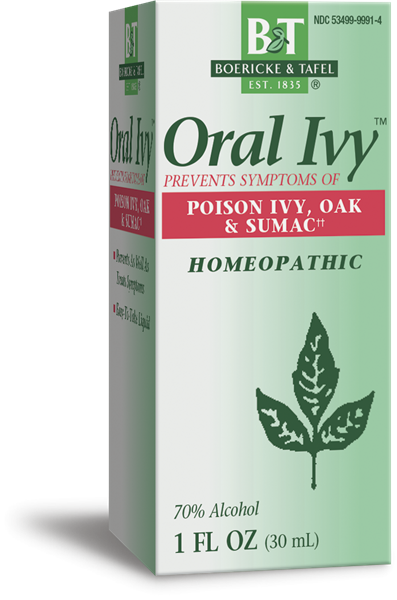 Oral Ivy Liquid / 1 oz - Nature's Way®. Prevents as well as treats symptoms of poison ivy, oak & sumac.†† Easy-to-take liquid. For Prevention: Adults and children 12 years of age and older: take 3-5 drops (0.13 mL) and add to 2 oz. of water. Children under 12 years of age: consult a physician for use. Continue usage by mouth for 7-14 days before exposure and continue throughout the poison ivy season. For treatment of symptoms: Adults and children 12 years and older: take 10 drops (0.26 mL) in 2 oz. of water every 2 hours as needed. Children under 12 years of age: consult a physician for use. As symptoms improve, decrease to once every 4 hours, then twice daily until symptoms disappear. Place mixture of Oral Ivy™ and water under tongue at least 15 minutes before or half hour after eating, brushing teeth or drinking anything except water. Do not use if hypersensitive to this or any other ingredients in this product. This product contains poison ivy (Rhus tox) plant materials. Stop use and ask a doctor if condition worsens or symptoms persist for more than 7 days. Discontinue use and consult a physician. These can be signs of a serious condition.